This game was invented in (or before) 1923, by Mr. Hugo Legler, of San Francisco (later of Oakland), California. Mr. Legler was several times the state chess champion of California. His proposal is played on the normal eight-by-eight-square chessboard. The queen's rook is replaced by a chancellor, combining the powers of rook and knight, and the queen's knight by an archbishop, combining the powers of bishop and knight. The Mechanics Institute Chess Club in San Francisco, where Mr. Legler then played, had pieces made for the new game, and in April 1923 held a tournament. A traveling reporter for the American Chess Bulletin, Mr. Leander Turney, reported that the chancellor was in the form of a rook surmounted by a horse's head. This was judged satisfactory. The archbishop was a horse's head on an exceptionally tall pedestal, and the reporter called for its replacement by a horse's head with a split miter on top. Mr. Turney also suggested moving the Archbishop the the King's side. This variation is also included in the Zillions rules file, mentioned below. 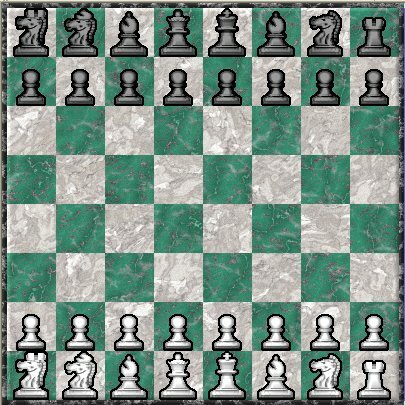 Chess set image created with Zillions of Games. It's hard to tell whether this appeared before or after Capablanca's. Legler a California chess champion puts one RN and one BN on 64. Replying to Charles Gilman: Legler probably allows 'castling' using the Kings and the pieces in the corners of the board. So leaving the Rooks on the h-file means that they will still be available for castling after the Chancellors have left their home squares. When I independently came up with Paulowich's Chancellor Chess in 1997, I started off with that kind of castling rule. My variant just adds Chancellors (on the a-file), but also switches the Queens with the remaining Rooks. The revised version replaces castling with a King's Leap rule. Currently playtesting my Zillions file (kingleap.zrf) for this King's Leap Chess. <p>Michael Howe cites Schmittberger as giving the Marshal and the Queen equal value in 'Grand Chess.' Wow! I consider the Chancellor (Marshal) to be at least a pawn lower than the Queen in Unicorn Chess and Unicorn Great Chess. Note: the Piececlopedia entry for Camel has recently turned into a mini-debate on piece values. What's this about the beginner's scale being 1-3-5-9? I never saw that until I came to chessvariants.com. Every source I'd previously seen said minor pieces were worth 3.5 pawns each. I am slightly surprised that the new compound pieces are on Queen's-side files. Does this really play better than having them King's-side? I've found that the BN is about halfway between the R and Q in value, 6.5 pawns for Spielmann values. (I agree with Ralph Betza that Spielmann values are more correct than the beginner's 1-3-5-9 scale.) Ralph methods rate it at 4 atoms = 6.5 pawns. Note the following: 1 atom piece (Wazir) = 1.5 pawns 2 atom piece (Knight) = 3.0 pawns 3 atom piece (Rook) = 4.5 pawns 4 atom piece (BN) = 6.5 pawns* 5 atom piece (Queen) = 8.5 pawns 6 atom piece (RNN) =10.5 pawns* 7 atom piece (Amazon) =12.5 pawns* * Hypothetical Spielmann values Pieces of Rook-strenght or less obey the equivalence 1 atom = 1.5 pawns, but stronger pieces seem to gain additional value. I assume this is because the strong pieces normally mask the weakesses of their components. So rather than giving the BN a bonus for not being colorbound, a colorbound 4-atom piece (Bishop-Camel for example) should be penalized. Also note the each simple piece had one major weakness: Knight: Short range Bishop: Colorbound Rook: only 1/4 of its moves are forward So BN, RN and Queen all mask two major weakness. Author: John Ayer. Inventor: Hugo Legler.